U.S. Army Cpl. 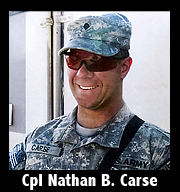 Nathan B. Carse, 32, of Harrod, Ohio, assigned to the 2nd Engineer Battalion, 176th Engineer Brigade, based out of White Sands Missile Range, New Mexico, died in Kandahar, Afghanistan, on Feb. 8, 2011, from wounds suffered when insurgents attacked his unit using an improvised explosive device. He is survived by his mother, Janis; and sisters, Megan Brown and Kristin Purdy.